Let’s talk about the Chuwi Lapbook Pro 14 this time. A beautiful Windows 10 PC with a beautiful outward look and sturdy feel. 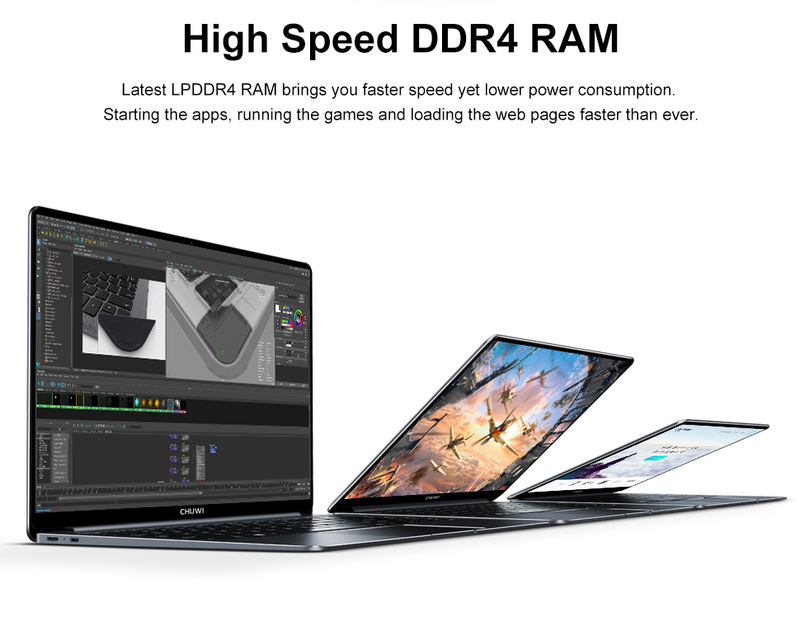 The PC was released back in February 2019 making it an upgrade to the previous Chuwi Lapbook Air 14 which was released back in 2017. The new Lapbook Pro is the 3rd in the Lapbook series of computers designed and marketed by Chuwi. The computer features the Intel Gemini Lake 4100 CPU as well as a 4GB RAM to work in with it’s 64 GB ROM which can be extended using an external SSD drive. Chuwi made the switching of the SSD drive way easier by positioning a little section that can screwed open at the bottom of the PC just near it’s speakers. When I first stumbled upon the Lapbook Air 14 back in 2018, I was really astonished considering the way the company managed to build such an ultra-book that looked so beautiful. While the beauty isn’t just enough, the device is really great at handling basic tasks thrown at it. The new upgrade to the Lapbook series is expected to tackle some of the previous errors and lags which were experienced in the previous lapbook. It has a massive HD display and it’s keyboard has cool back-lit making the device easy to use in a dark environment. The 14.1 inch display is also well laminated making it glossy and the anti-scratch screen makes it feel like a touch screen device though it isn’t. Talking about features and upgrade, the New Chuwi Lapbook Pro features a USB Type-C port for charging and all sort of tasks that sets it aside from the previous version which doesn’t. But the presence of the USB Type-C has a bit of a disadvantage which is the reduction of the numbers of USB port present on the new version unlike the Lapbook Air. But that could be a disadvantage to some especially with the absence of multi-USB ports. The Inclusion of USB Type-C had been sort of obligatory in Laptops since late 2017 and seeing that on the Chuwi Lapbook Pro makes it really fitting. One turn off about the device is the absence of fingerprint scanner. My experience with the device had been a great one and I’d say it’s really worth the price-tag slapped on it. But then let’s examine these features one after the other. There isn’t any big difference between the Lapbook Air and the Lapbook Pro because they’re both inspired by one another. But the major difference would be the bezels on the Lapbook Pro. As it was before on the Lapbook Air 14, the Bezels were obviously there and can be seen when the screen lights up. But the reduction of the bezels on the new Lapbook Pro makes it very interesting and outstanding. This also made it a bit smaller than it’s predecessor. Another thing I took note of on the new device is the increment of the trackpad. It’s now larger and wider. Since it runs on the latest Windows 10 OS, the gestures on the Trackpad are still there and this is really obvious. The logo back-lit is still there on the device which is part of what makes it beautiful when it’s powered on. 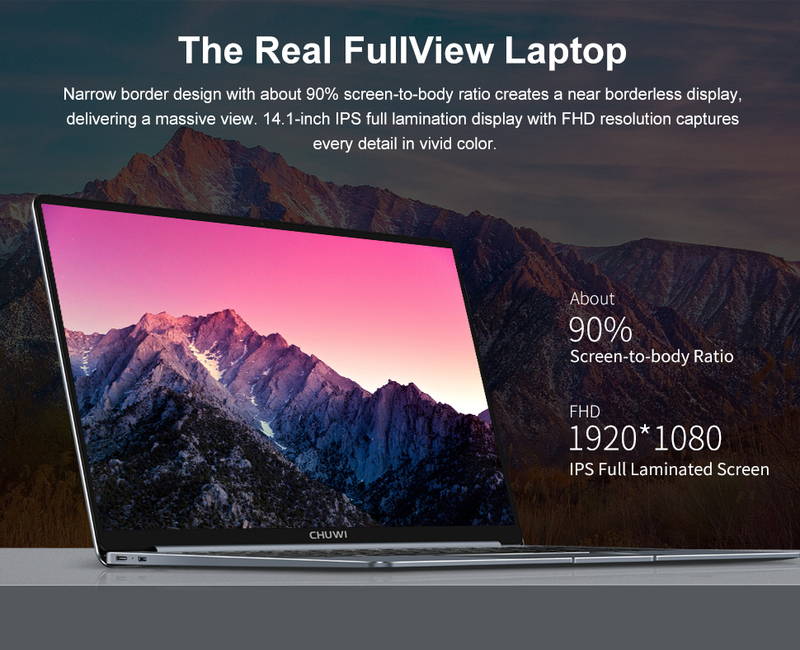 The Chuwi Lapbook Pro has a 14.1 inch display which is HD and a pixel of 1920 X 1080 which is great enough. The display is fully laminated and it’s an IPS display too. One thing that I found interesting about the device is the fact that turning on the device to a side, despite it’s screen resolution, it still feels great and the color doesn’t fade or turn negative from whatever angle I turn it to. The lamination could be a little bit of a disaster when been used in the opened field where there is direct sunlight pointing on the screen. Let’s say that you’re the type that likes to take your PC with you where you go especially on outdoor events, then you might want to sit where there would be a bit of shade or at least don’t sit where there the light points directly on the device’s screen. Watching movies on this device is really great. For example, I watched the Baby Boss movie on it which is really colorful and It was really amazing. The same with Hotel Transylvania 3. The color are vivid and very warm. The windows 10 night mode which I love to use to keep my eyes safe from Blue-light effects still feel great rather than turning the screen UI into a sort of Brownish elements. Overall, the screen has it’s advantage and it’s disadvantage but I wouldn’t expect too much from this laptop because of the pricing and while the pricing doesn’t necessarily dictates it’s quality, It’s worth noting that the device is an entry-level PC not even a mid ranger. From 4 USB Ports on the older Chuwi Lapbook Air 14, the new Lapbook Pro now has a total of just 2 USB ports with one of them being the USB Type-C port. While this isn’t necessarily a break through especially considering the reduction, there are also missing ports such as the Ethernet port, Memory card stick port. The inclusion of a swap-able SSD card slot on the bottom might be the reason for the demise of the M2 Card reader slot. But then, there are adapter that can take in virtually anything like more USB ports, Ethernet port and HDMI ports all connected to the USB Type-C port of the device. Not a bad idea though. Things just need to get better. The Chuwi Lapbook Pro is powered by a 7.6V/38Wh battery which keeps the laptop working for long hours. During my run wuth the device, although I was out on the field trying to test out how powerful the battery could be, The battery which was at 100% at the time of setting out from the office took about 4 hours to get rid of about 39% of the battery power. Well that could be because I didn’t use powerful features such as trying to make UI/UX Mock ups with power hungry applications and software like Adobe Creative Suite. Also do note that most of those 4 hours, I was doing my conventional job which is surfing the web and writing stories. I watched some videos on Youtube and then played music using the headphone jack port. Things were smooth actually and It doesn’t feel awkward at any moment for the fact that I’m working with a new laptop gave me the confidence to do with it whatever I’d love to. I was able to develop 2 stories using the Chuwi Lapbook Air which took me about 3 hours in general to complete and that was really good. Although I was tempted to try out much more powerful programs rather than just sitting down ope navigating tabs of web browsers, I wanted to use the device not for too much power straining tasks instead, to just work with it and see how great it could be. Yeah! Fast in the sense that it could handle any given task thrown at it conveniently without any lag in as much as you’re not running too much power intense programs in the background. Like I said earlier on, during my time with the Chuwi Lapbook Pro, I was tempted to try out Android Studio software on it but nope I didn’t at first until I got back to office after my 4 hours stint with the device. While it’s still has a great deal of battery to consume, I then plugin to the company’s network and downloaded the 1GB Android studio and other addons which made the program’s size around 2GB altogether. Launching the Android studio took a really long time before it would come up and when it finally did, It took it another 10 minutes to boot up the User Interface for the coding. I had to wait to eventually build a Hello World app which I was ready to test out using the Emulator. Building one was fast but launching the emulator seems impossible. During this process, the device was already hitting up and the battery too was draining fast. It took me about 1 and half hour to get the Android Studio functioning and even launching a simple Hello World with just a few lines of code seems impossible. That made me realise the device isn’t for really big tasks. While Chuwi had claimed you can even work with powerful tools like Blender for example on the device, I realised that was just a hoax and will never be possible. Imagine running Blender, Adobe Photoshop CC and then Android Studio on the laptop, it would likely shut down instantly. But then I still didn’t end my performance test there. I tried out with a simple game like Age Of Empire and Candy Crush on the device and of course, they both did well. Trying to upgrade to PUBG which uses an intense amount of RAM allocation and powerful Graphics, nope, it didn’t work. The Chuwi Lapbook Pro is powered by the Intel’s HD Graphic Gen9 unlike NVIDIA in other premium gaming laptops. 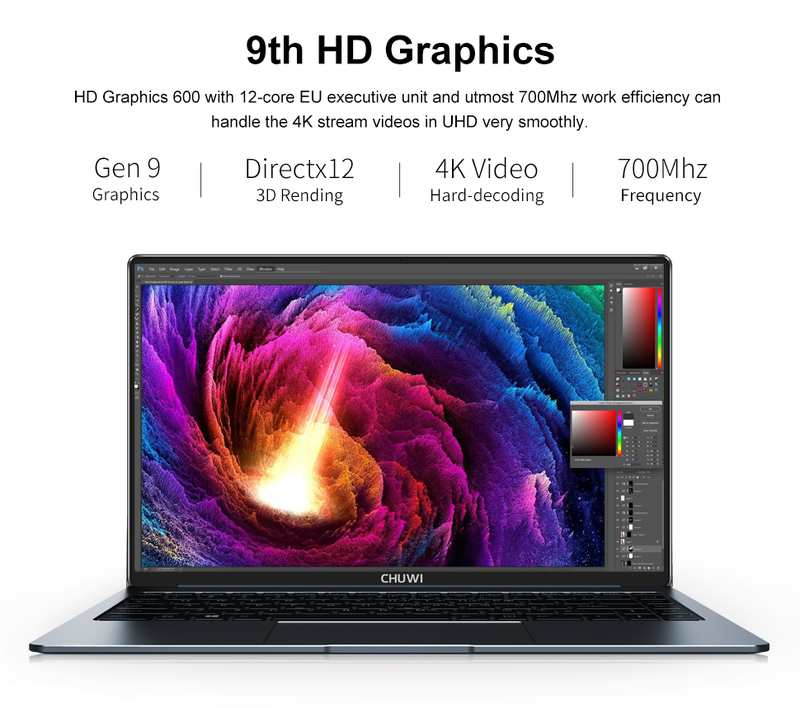 The Chuwi Lapbook Pro runs on the Intel Gemini Lake N4100 which is an entry-level CPU compared to the Core-i7 9th generation now found ont he Huawei MateBook X Pro that costs $1000. The overall conclusion on the speed of the Chuwi Lapbook Pro is moderate for users. Which places the computer as a simple tool for presentation, web surfing and simple tasks such as image editing and so forth but it can’t handle intensive tasks. The Audio quality isn’t bad for a twin speaker fond underneath the device. First, I always have to increase the volume to at least 50% if I’d like to hear a bit of what is being said within the PC while I was outdoor. While many laptops even the Macbook Air is guilty about this too, the Chuwi Lapbook Pro’s speaker isn’t very fantastic at least, not overtly loud. The quality of the speaker in terms of bass and audio sequence separation isn’t bad but Chuwi could do better. Using third-party software like the VLC player, I would turn on the equalizer in order to enhance the audio sequences that made the audio quality better while using an headphone jack. But using the speaker directly isn’t very great but not bad. WhO Should buy the Chuwi Lapbook Pro 14? Anyone who wants a better device to do simple tasks. While this laptop isn’t meant for computer or gaming programmers or Designers, You can use it to record podcasts. It can be a great tool for researchers as well who are going to be needing a long battery and easy access to the internet. If you’re also a blogger or YouTuber, this would also be a great tool to speed up your job. I think Chuwi knows their audience and majority of those that uses entry-level PCs are usually people who just need their computer as a storage and data center for their projects and works instead of avid computer gamers or designers and programmers. It can also serve you as a second laptop which you can carry around and along with you wherever you go considering it’s size that is easy to tuck in anywhere in your backpack or just in your briefcase. Is the Chuwi Lapbook Pro officially released yet. Also the link goes to Lapbook Air not Lapbook Pro. I'd like to get the upgrade. Please revisit the link and update. Thanks guys for such a beautiful post.